Welcome back! We’ve still been playing Reavers and writing up session summaries, but I am sadly delinquent in posting them as blog posts. This summer, I intend to catch you all up! Follow along and read the adventures of the most dastardly batch of pirates to ever bedevil Golarion! Fifth Session (21 page pdf) – “Patching In” – More business on the streets of Riddleport; beating up locals, recruiting new pirates, plotting and scheming… And it is capped off with a pirate party to end all pirate parties! First they interrogate an anti-Cyphermage agitator and realize his organization is backed by the Zincher crime syndicate, who since the tsunami have become a lot more of the “patriotic community association, that will still break your kneecaps” type. Then Wogan starts to get concerned about his sister, who has moved to Nidal and married some local. A visit may be in the offing! And Serpent and his wife Samaritha go shopping for an egg-case (lest you forget, she is a serpentfolk who disguises herself as a half-elf). They also follow up with Salvadora Beckett of the God Squad, an undercover branch of the gendarmerie that investigates evil cults and keeps there from being too much religious influence in the city. This is something I imported from the Freeport setting into Riddleport. 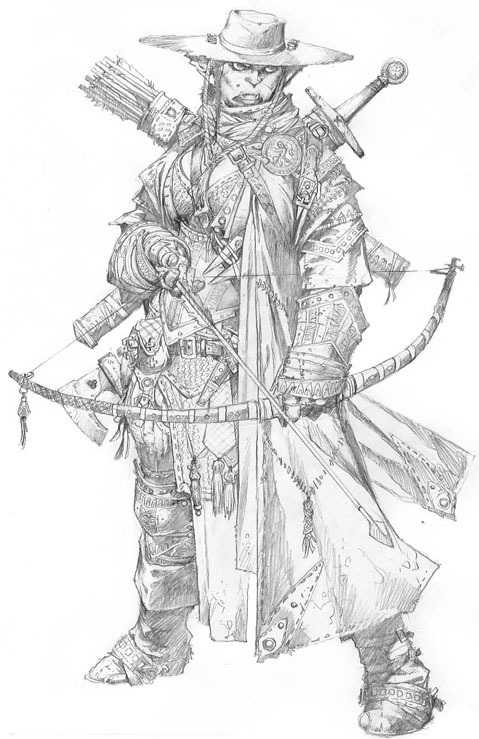 Keep in mind as you read the following that I use the picture of butch iconic half-orc inquisitor Imrijka as her character portrait (above). Salvadora’s eyes slide over to Serpent, who shuts up. Salvadora consider this then replies, “I do have a hanging harness.” She clomps off. Wogan tells Sindawe, “I think she was hitting on you.” Sindawe thinks about that possibility. Also, they are rewarded for giving over the remaining Yellowjackets (Calistrian assassins) to the law by a raise dead scroll for the murdered Little Mike. Then they recruit some new pirates. This is always a fun time, and something I have to prepare a lot for. I have to come up with a list of pirates for them to interview, some high level, some low level, all with various personality disorders, some actively traitorous and some just passively traitorous. You never know what they’ll like or not like. Duke Ron (based on Kurt Russell’s “Captain Ron” character) was meant to be all lively and piratey but they hated him. Cannonball Jack, Nemo, Kent, “Ragged” Pete Morgan, George Peters, “Long” Bonifacio Copper, and Kitty the Cantankerous are all welcomed aboard, despite some of them kinda obviously sucking. And Melella, a half-elf druid they met during their investigation of Little Mike’s murder who took a liking to them. Then they meet Captain Sempronia, who has open enmity with Duke Ron. They go with Sempronia, which will be revealed as a terrible mistake later. Then it’s time for the after-party. The huge, Sons of Anarchy style dock party with loads of rented hookers and VIPs and crime lords and disguised succubi and Cyphermages and demon assassins. But before the demon assassins, Sindawe came up with a whole motorcycle gang vest and patching plan. Check out the summary for the details. 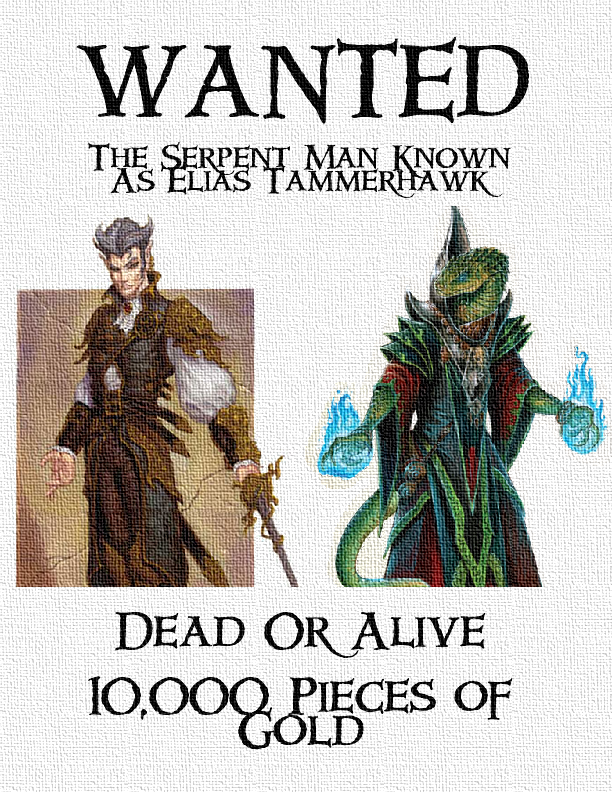 And the Overlord gives them a warrant for the serpent man known as Elias Tammerhawk – 10,000 gold, dead or alive. They like this, they hate that guy (lest you forget, he blew up the Riddleport Light and caused a tsunami to hit Riddleport and got glyph-shards embedded in the PCs and all kindsa stuff like that). The PCs really enjoy their party, and I generate all kinds of interesting “party fouls” for them to watch or participate in or whatnot. I enjoyed Wogan maintaining his priest-of-Gozreh chastity despite a succubus grinding on him. This entry was posted in session summaries and tagged actual play, adventure path, D&D, dungeons and dragons, orcs, Pathfinder, pirates, reavers, riddleport, RPG, RPGs, session summary, story hour. Bookmark the permalink.